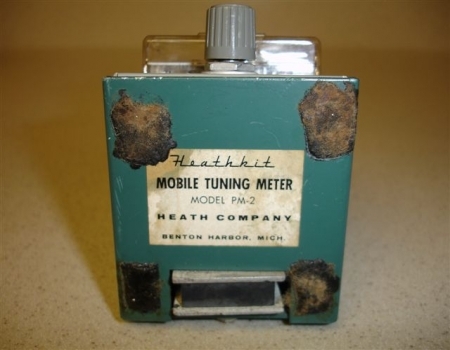 The Heathkit PM-2 mobile tuning meter is a sensitive portable instrument for the measurement of relative power output of mobile transmitters. The signal radiated by the transmitter supplies the necessary operating power and no other power is required. 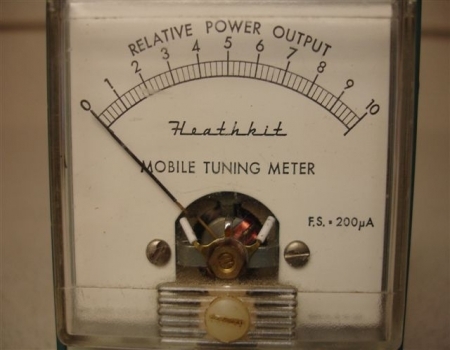 While this instrument is designed expressly to serve as a mobile transmitter tuning meter, the PM-2 finds application in fixed station use as well as an output indicator for any transmitter. The magnet on the bottom is incorporated to secure the unit to any metal surface. 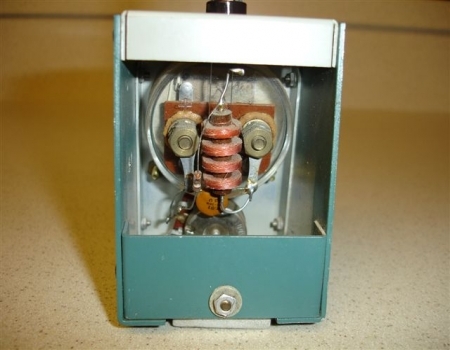 I have this meter in use and sitting right on top of a power supply in the radio room. It is fun to watch it waving to me during transmissions. The more idiosyncrasies on a piece of electronic gear or at the operating station in general the better. The picture on the left is of the back of the PM-2. This instrument is made up of basically 5 internal parts. 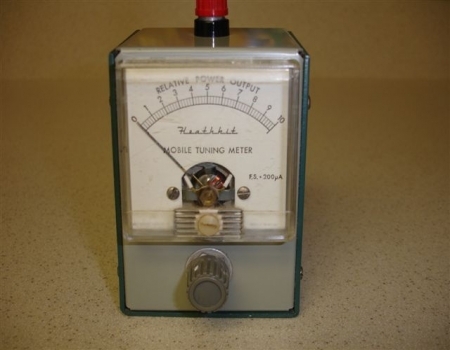 These include a diode, resistor, capacitor, choke and a meter. Many of these parts can be seen in the picture on the left. The picture on the right is of the bottom. The magnet that was mentioned above is located at the bottom of the picture and is located on the bottom rear of the instrument. The rubber feet in this example appears to have been the victim of thermal heat transfer that was re-radiated after arriving from 93 million miles away. Or said another way, from a hot car roof.